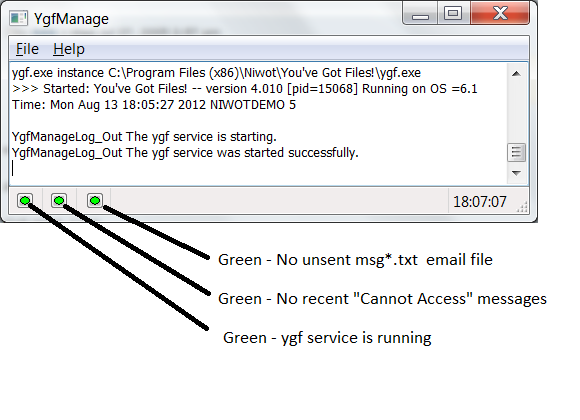 ﻿ SFTP and FTP Monitoring with Email Notification ... You've Got Files! Automatically send a file arrival notification email or launch an application when there is a change in the contents of a monitored FTP site, monitored FTPS site, watched SFTP site, monitored local folder, or watched network folder. Schedule scanning of each monitored location by hour of day, day of week, and day of month. Monitors up to 2 locations, each location includes all of the subdirectories within the location. A single directory location spec can monitor and notify for an entire FTP site. Sophisticated filters allow you to Include and Exclude Folders and Filenames from monitoring. Monitors up to 100 SFTP, FTP, FTPS, local, and UNC-accessible locations. Custom email notification for each FTP, local, and UNC-accessible directory. Supports launching applications and customizing your notification email subject line. Monitors and generates notification emails from an unlimited number of locations SFTP directories, FTP directories, FTPS directories, local, and mounted directories. Eliminates the the "You've Got Files! http://www.niwotnetworks.com" branding at the bottom of the email. OldFileDetect and OldFirstLevelFolderDetect support allows you to automatically remove and archive files from your monitored location based on age. Multiple Instances on a single computer provides faster monitoring of FTP sites. Fast notification when monitoring thousands of UNC-accessible and local locations. Embed images in your notification emails. Printing Companies use email notification. Johnson Printing's press supervisor, salesman, and customer needed to be notified when new files had arrived on a customer-by-customer basis. You've Got Files! ability to provide custom email notification by directory was key to meeting this need. Estey Printing's Bill Eikenberry says "Now I won't have to hear somebody screaming at me that they uploaded files to the ftp server 2 days ago!!!" American Color had a master font directory, multiple sites needed to be notified of any changes to that directory. You've Got Files! sends an email notification if the file time or file size has changed. Fry Communications uses multiple copies of You've Got Files! to generate email notification of files arriving from customers as well as files being moved between facilities using Niwot's Gigabyte Express file transfer software. Financial Institutions use email notification. Compunet Credit Services "We have specialized automated software that uploads files to a FTP server from clients all over the country. We need to know when these files are uploaded, so we can import the data as soon as it arrives. You've Got Files! fits perfectly. The best product of its kind we've found. Great job!" Matthew Steinblock, Compunet Credit Services, Inc.
Heartland Financial Monitors a Netware volume for arriving financial documents. Fast Cash Processors receive an email notification when their FAX server places loan applications and information in a monitored directory. Printed Circuit Board manufacturers use email notification. Titan PCB, Jabil Circuit, Titan EMS, Harbor Electronics Printed Circuit Board manufacturers are notified by email of incoming orders and specifications. Direct Mail printers use email notification. Texas Mail Center and Alaniz are notified by email of incoming lists and specifications to be used in printing a variety of direct mail pieces. State of New Hampshire has multiple pages on its web site that may be modified by many departments. The web administrator uses You've Got Files! to monitor the entire web site and be notified by email of any changes. On Course Information Systems monitors a mixture of mounted drives and FTP-accessible volumes. Their business involves sending large numbers of files to a customer's FTP site, they use You've Got Files! to monitor the FTP site and generate an alert to the customer when file transfers are complete. Bases Loaded, Inc. is a service bureau that converts PPO (Preferred Provider Organizations) provider, facility, and fee schedule data into their client's specifications. Bases Loaded uses You've Got Files! to notify their clients when their formatted data files are available.